: After decades of relative anonymity, this nondescript Eagle Rock pizzeria has emerged as one of Southern California's legendary eateries. Folks drive considerable distances to take home the prized pies. A crispy, slightly chewy crust, subtly tangy tomato sauce, better-than-average mozzarella, and quality toppings like homemade Italian sausage, artichokes and sun-dried tomatoes make it worth the trip. Also on the menu is a Hawaiian-style pizza, which is what an Aloha State kid named Barack Obama used to order when he attended nearby Occidental College. 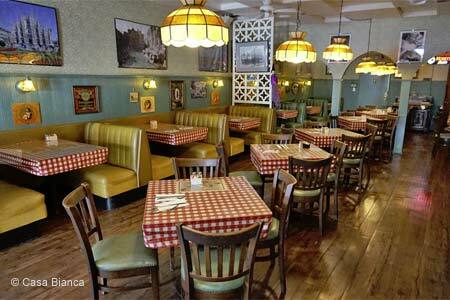 Although most pizzas are ordered to-go, the always-full dining room, with its red-checkered tablecloths, is a comfortable enough place to enjoy respectable salads and a generous array of pastas, in addition to the main attraction.